There are, per Wikipedia, a combined forty-eight television and film adaptations of Charles Dickens’ A Christmas Carol. I knew I wanted to write this month’s Anatomy of a Scene on Dickens’ classic Christmas tale, and when planning it, I pretended to consider various different adaptations — how many I wanted to include, how I might structure their comparisons, and so on. But when I really searched my feelings I knew there was only ever one I wanted write about one. Truly there is but one Christmas Carol of my heart and The Muppet Christmas Carol is it. I think it behooves us all to consider the subjects on which we cannot be unbiased and, when addressing them, to proceed with good-natured candour. The Muppet Christmas Carol is such a subject for me. I have seen other adaptations and they all fall woefully short. I even — sacrilege of sacrilege around these parts — prefer it to the book. In my opinion, if Dickens had wanted me to like his work more than the Hensons’ he probably should have included more catchy tunes and fuzzy-faced animals of unknown taxonomy. Heart-bias aside, I truly believe (with my objective, analytical brain) that The Muppet Christmas Carol is genuinely worth rich and detailed discussion. It is a fantastic adaptation of A Christmas Carol and one of the most inventive, successful cinematic literary adaptations of all time. It has all in a film and in an adaptation that is pleasing: a strong performance that anchors the central character, a fantastic overall “cast,” a great script, and direction with an eye for detail. Most importantly, it manages to combine fidelity to the source material with its own spirit. Dickens, with his occasionally schmaltzy sentimentality, easily-digestible morals and penchant for eccentric characterization is really a perfect match for the wacky, winsome Muppets. 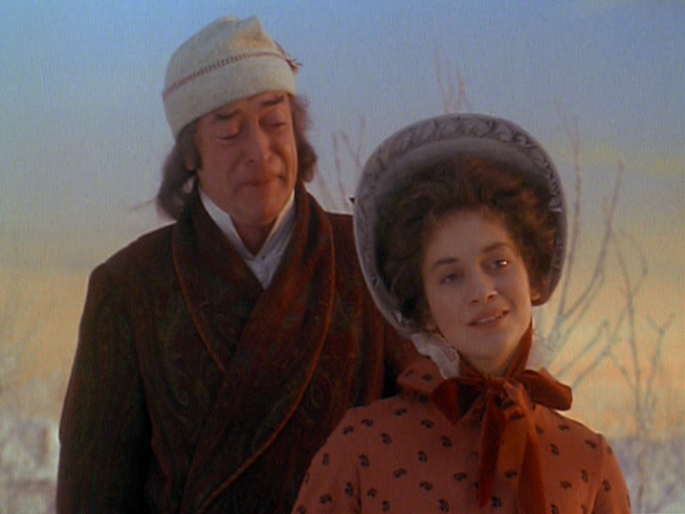 And one of the most consistently charming elements of this film is how much Dickens is in it. Starting with Dickens himself — or rather, with Gonzo playing Charles Dickens. But perhaps the most delightful thing about the meta-fictive Gonzo-Dickens is the reason why director Brian Henson included him in the first place: to maintain as much of Dickens’s prose as possible. This is one of The Muppet Christmas Carol’s biggest charms: the touching faith it evinces in children to follow sophisticated and occasionally even archaic language. Lines are altered for clarity or currency in The Muppet Christmas Carol but nothing is dumbed down and the script keeps all of Dickens’ Victorian flavour. The original songs and score by Miles Goodman are another point in the film’s favour and consistently good at adapting the text. 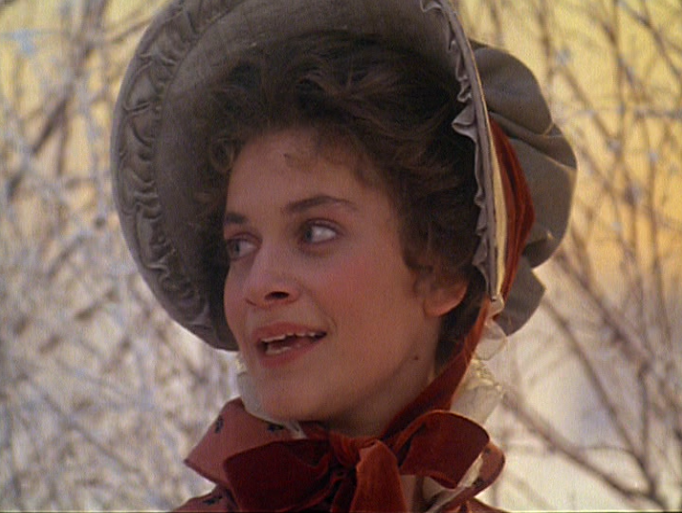 Goodman’s musical numbers manage to be eminently hummable while communicating important emotional and narrative beats and staying consistent with Dickens’ tonal blend of sentiment, humour, and horror. With such an actual wealth of riches to choose from, it was hard to choose a single scene. I did manage to pick one, but with a catch: you may never have seen most of this scene, even if you’ve watched the film a dozen times. The scene I’m referring to the one in which, despite Scrooge’s pleading, the Ghost of Christmas Past forces him to revisit his last moments with his first and presumably only love, Belle. This scene was originally intended to include a farewell song sung by Belle. “When Love is Gone,” is a bittersweet, melancholy lost-love ballad sung by a character with only a few lines in the film and Producer Jeffrey Katzenberg feared it would be too sad and lose the kids in the audience. He insisted, over Hensen’s strong objections, that it be cut from the theatrical release. The song was restored for the VHS release and is available (in full screen only) on the 20th anniversary DVD, but has not been included on the Blu-ray or Netflix version. “When Love is Gone” is an admittedly somewhat heterogeneous moment: a sad, slow and distinctly adult song in a film where even macabre appearance of Marley(s) includes jokes, dancing, and of course, singing inanimate objects. Whether or not the song would/does actually momentarily lose kids is debatable (possibly some, yes; definitely not the pint-sized romantics like me). Cutting it is antithetical to the spirit of the rest of the film and to its belief in its young audience. A film that communicates primarily in Dickensian prose should be a film willing to believe in this same audience’s ability to grasp some more complicated, grown-up emotions. 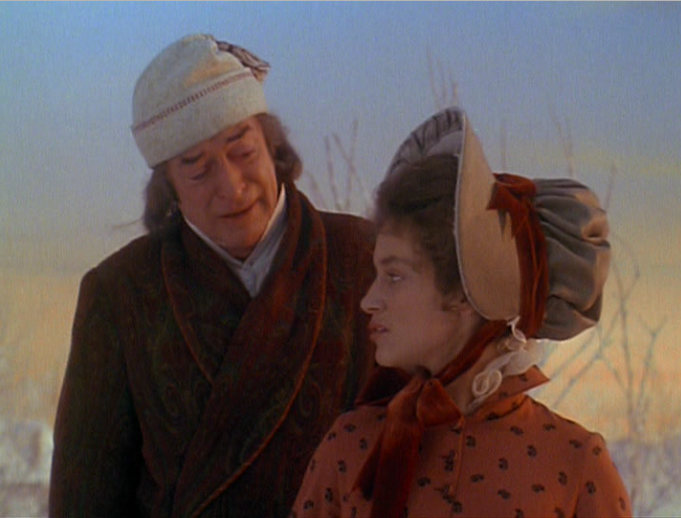 What it also clear is that The Muppet Christmas Carol is a better film and a better adaptation for having it left in. I admit that Amazon reviews are not always the most reliable or coherent arbiter of … well anything really, but when the opinion on a subject is nearly unanimous across hundreds of reviews it might be wise to take notice (ahem, DISNEY). 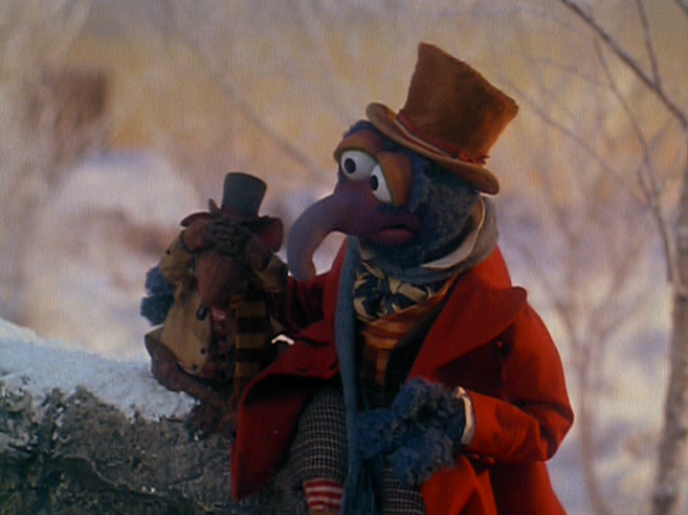 With “When Love is Gone” included, this scene marks The Muppet Christmas Carol’s most significant departure from its source material – and its most important. Back to the book, for a moment: in the Second Stave of a A Christmas Carol, the Ghost of Christmas Past shows Scrooge his final Christmas with Belle. 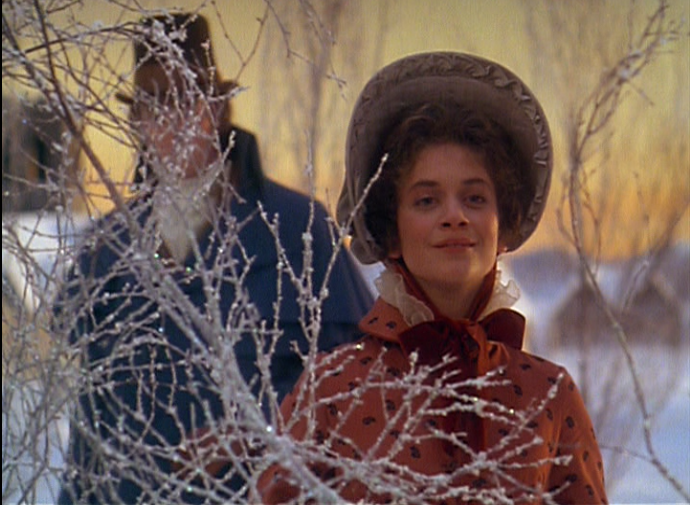 Dickens, through this woman, is fairly explicit about why young Scrooge kept forestalling his marriage to Belle: he no longer wished to marry a woman who didn’t come with a fortune. She calls him on this and frees him from their engagement, then they part forever. Scrooge is less moved by reliving this parting than he is by what the Ghost of Christmas Past shows him next: a recent past Christmas for Scrooge’s lost love and her family. While this realization might have landed for Dickens’ audience to a modern reader it is jarring and even slightly creepy. Dickens has written some fascinating female characters (after all, he gave us Miss Havisham, the willfully grotesque ball-buster mascot of our hearts) but this is far from his best treatment of female characters. The woman he is sexualizing here is young enough to be his daughter (and indeed, in the same scene he both longs for a daughter like her and longs to touch her mouth). And it’s hard to avoid the fact that Dickens is suggesting the value of a young woman lies in her willingness to dote on a man, and that the role of an older woman lies in her willingness to spawn her replacement before quietly becoming invisible. 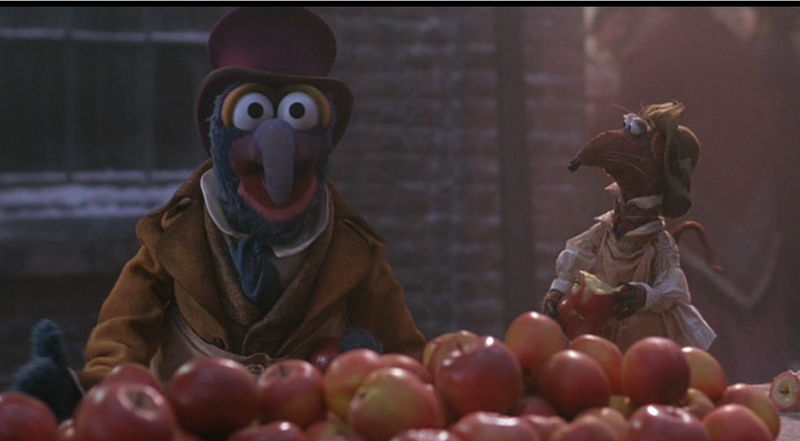 Thankfully, The Muppet Christmas Carol forgoes this moment entirely. Instead, it focuses on the Belle-Scrooge parting scene and, with the song Hensen always intended to include, literally gives voice to Belle. In The Muppet Christmas Carol this scene is about a true loss of love and human connection, not of a loss of permanent source of ego stroking. If you haven’t seen a version that includes “When Love is Gone,” you can watch the song here. Meredith Braun has a sweet, somewhat breathy voice and sings wistfulness well, but this moment largely succeeds on the strengths of Hensen’s direction and Caine’s genuinely moving performance. [An aside: several years ago I solidified a burgeoning friendship with the tipsy non sequitur that Michael Caine is the greatest Muppet actor OF ALL TIME. I do not stand by all my inebriated declarations, but I have never had cause to regret this one. Caine is absolutely tremendous. He is Ebenezer Scrooge, period, not “Ebenezer Scrooge in a Muppet film, ha-ha isn’t this fun?” There is no wink and nod, no campy overacting, or mugging for the camera. Michael Caine doesn’t condescend to the Muppets. Michael Caine gives it to us straight and delivers an alternately despicable, hilarious and heartbreaking performance]. If you watch the theatrical cut, this is where the moment ends and the camera cuts to the ever-sensitive Rizzo, weeping and being comforted by Gonzo-Dickens. It’s a weird, discordant reaction to a relatively cordial and bloodless parting, but when you realize that an entire farewell song has been cut, it starts to make a lot more sense. The tone of their farewell, on Belle’s side, isn’t bitter but wistful: Belle sings that she knows Scrooge “cared for” her and tells him “I wish you well, but I must leave you now alone.” She gives Scrooge, undeservedly, the benefit of the doubt and chalks his lack of love for her up as “Adventure calls with unknown voices, pulling you away.” Of course, we know it isn’t adventure pulling him away at all – quite the opposite. There’s no risk in loving something that can’t ever love you back. As Belle sings, she walks further and further away from young Scrooge into a wintry churchyard. She pauses and he comes to stand behind her, often obscured by icy branches or subtly out of focus, but always fundamentally distant. He only tries to touch her once, when she comes to a small brick bridge. When Belle reaches the top of the bridge and looks back at Scrooge she sings with her first real note of warning: “Be careful or you might regret the choice you make some day.” The framing is beautiful: Belle literally has the higher ground, and her body is facing away from Scrooge with her head turned back to look at him one last time. Belle will cross that bridge and cross into the future, but young Scrooge is only going backward. The version of him that is capable of love remains frozen in the past. It’s at the point that older Scrooge comes to stand behind Belle and start singing along with her. Caine is a graduate of the illustrious Rex Harrison “Can He Actually Sing?” “I Mean, Does It Matter?” School of Vocal Accomplishment and it works in his favour here. He only sings four lines but they’re every one of them heartbreaking. Caine’s hoarse and sometimes broken voice resonates with grief and loss as he tearfully sings. The lines Scrooge chimes in on are those of lost possibility: almost love, almost always; some dreams come true but some dreams fall (or, it is implied, are let slip) through. And his face! At one point in my rewatch I turned my partner with what I can only describe as Puss-in-Boots eyes. “It’s hard to keep a dry eye when Michael Caine is crying,” he admitted, which is about the gist of things. 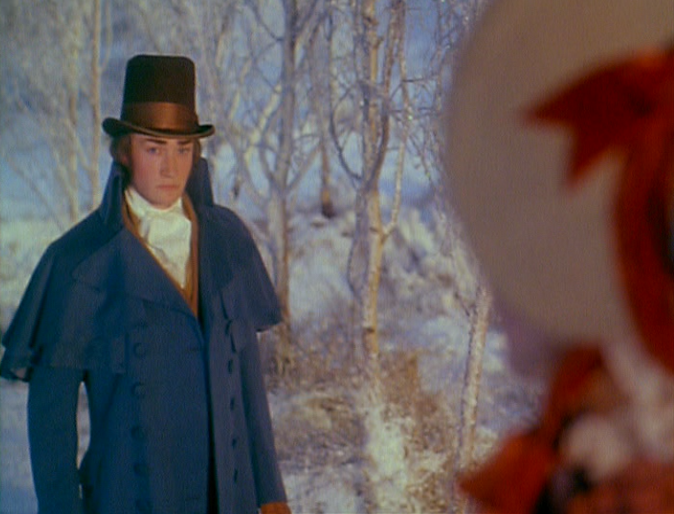 Beyond Caine’s performance, the very fact that Scrooge even knows the words at all is heartbreaking. At this point his younger self had supposedly left, but now we realize he heard everything — and forgot nothing. He knows the words. This is a moment he has replayed in his mind, over and over again. Suddenly his pleading the Spirit not to show him this Christmas becomes clearer: Not this, please. I know, I already know. Thematically, it’s a departure from a source text that focuses largely on revelation over remembrance — even when Scrooge is revisiting his past he is truly seeing things for the first time — but it’s one that’s easy to forgive. It adds a dimension to Scrooge’s character that isn’t present in the text and makes his pre-visitation nastiness that much more tragic and terrible. Even before his visitations, he knows enough to bitterly regret this loss of love and human connection but still he is heartless and still he pushes people away. 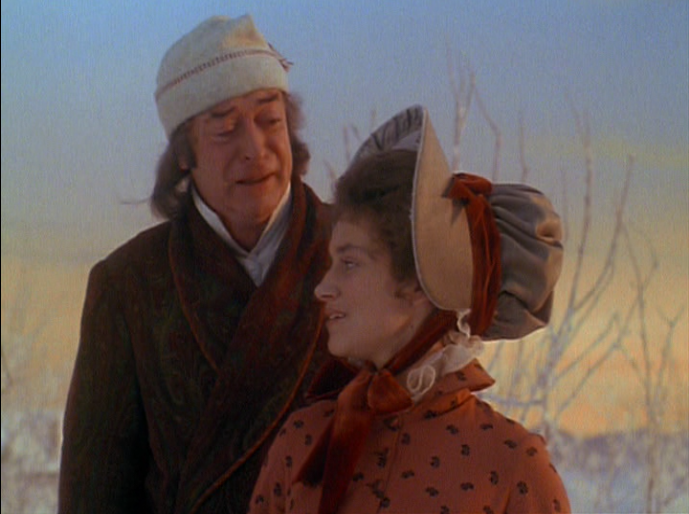 It’s a credit to Hensen and screenwriter Jerry Juhl that Scrooge never reunites with Belle. The second last number “A Thankful Heart” sees Scrooge reconnecting with the people from his past – his old employer Fozziwig, his former headmaster Sam – but Belle is nowhere to be seen, presumably off living her own happy life. Sentimental as it may be, there is still a sense of loss that permeates the A Christmas Carol, even to the end; Scrooge may see the error of his ways but there are some things you can never get back. The end of The Muppet Christmas Carol also reinforces the significance of the deleted scene. The film’s final number, “The Love We’ve Found” borrows the melody and several of the lyrics from “When Love is Gone.” These songs are like narrative bookends: love lost and love found, a break and finally, the healing. With “When Love is Gone” The Muppet Christmas Carol takes the generous, sentimental spirit of Dickens’ novella and injects it in a place where it might be lacking for a modern audience. And well, isn’t it just so gosh darned Muppet-like to look at something difficult and uncomfortable — something that maybe isn’t as compassionate as it it could be — and see in it the possibility for sweetness, sincerity, and and meaning?